One of the highlights of the annual Mid-Atlantic Air Museum WWII Weekend is the fast-fading opportunity to hear directly from veterans of the war. Presentations of their memories and moving stories are usually done from any one of several stages around the airfield. Attendees may also speak briefly with the vets during meet-and-greet sessions in the main hangar. 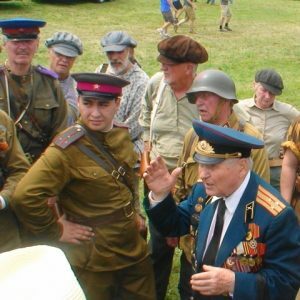 For the second year in a row, this reporter caught up with Soviet veteran Nikolai Zaitsev – not in the main hangar but in the Russian encampment at the end of the expansive airfield. Readers may recall that as a resourceful young lieutenant in Stalin’s army, Zaitsev survived some of the fiercest fighting of World War II. We were enjoying a lively discussion about Zaitsev’s participation in a London war museum exhibition, when the sounds of battle erupted some twenty yards away. Looking to the west, we could see two groups of reenactors – one German, the other Russian – engaged in a skirmish. The mock battle raged for less than ten minutes; just enough time to expend half a case of blank ammunition. But in those brief moments, Colonel Zaitsev paused to collect his thoughts. He had a message he wanted to share with the reeneactors. “For the first time, I wanted to meet you guys after the battle reenactment – after you fought each other – because I did it for real during the war. It’s important for people to see this and realize the true history of the war. That it was not a game; it was a bloody, serious business. “In WWII, over 50 million people died. The Soviet Union alone lost 27 million people. Many forget that war brings death – not only to the soldiers – but suffering and wounds to civilians; everybody involved. I, and other veterans like myself, would like to convey the memory of those who gave their lives. They should never be forgotten. “If people forget what happened, the written history could be changed, and that could pave the way to a new war. And a new war would take even move lives. “If you know the history; if you remember what happened – you will not allow politicians to incite these conflicts. Politicians never fight a war. That is left to the regular people. Germans, Russian; we are all people and we have to learn to live peacefully. “Never believe that people as a whole want to hurt you in such a manner. It is just certain people who derive power or wealth from fomenting war.